What is a Fusti & What Do I Do with One? 1. Think of a fusti like an olive oil dispenser in this case a very small and decorative one made for displaying on your kitchen table or counter. Fill your ceramic Fusti with an Infused olive oil handmade by you- Just use our kit of infused oil accessories that double as decor for your kitchen. In Italy this is quite common and olive oil is traditionally stored in Fustis and can last in your Fusti for up to a year. 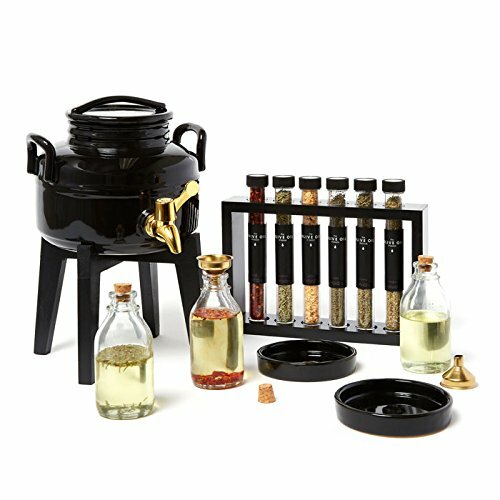 Infuse your own oil flavors- Blend your own flavored olive oil using your favorite combination of the included seasonings and spices and herbs and use the funnel to fill the glass bottles and fit with accompanying pour spout.. Seal the bottle, and let it sit in a cool, dark place for 1-2 weeks. The oil will infuse over time. Do a taste test after day four to check the flavor. When it reaches your desired taste, enjoy! A "Fusti" is a stainless steel or ceramic container specifically designed to safely hold oils, honey, and other liquids, for long-term storage. Quality matters, so don't compromise. An Olive Oil Fusti makes a perfect gift for any chef, restaurateur, or budding food artist! It protects your bulk food investment at home, and will last for generations to come. Discover why gourmet Chefs and cooks and Italian Culinary Artists are in love with the Fusti. We especially are addicted to these beautiful storage containers! Our Gourmet Olive Oil Gift Box Includes a Fusti with Stand, Spice Rack, Funnels, Dipping Plates, and Three Glass Bottles. Let the tasting begin! Blend Your Own Custom Infused Olive Oils for Flavors like Rosemary, Garlic & Thyme that can be used to Cook Fish or Chicken or Drizzled on French Bread and Finished with Parmesan Cheese Under the Broiler for Garlic Bread. We Guarantee You'll Love Displaying Our Gift Boxes, They're Gorgeous Chic & Totally Reusable. Each Item Inside Comes From Our Exhaustive Searches That Span the Globe Looking for the Best Tasting, Best Looking, and Most Unique Gifts and Gourmet Food & Beverage Items.